Elevation: minimum feet, maximum feet. Area Habitat: open land 3.05%, forest 93.62%, wetland 2.00%, open water 1.33%. For general hunting regulations and dates for Land Between the Lakes National Recreation Area hunting opportunities visit www.landbetweenthelakes.us. A hunter use permit, all applicable state licenses and hunter education card required. 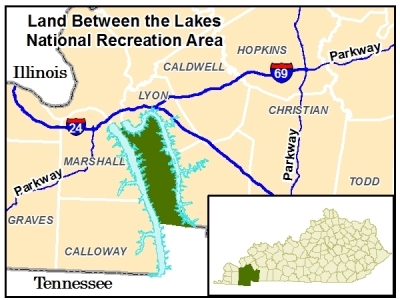 Long Creek Pond, the eastern one-third of Smith Bay and the eastern two-thirds of Duncan Bay on Kentucky Lake are closed to all activity Nov. 1 - March 15, as indicated by a visible marker on the south corner. The Environmental Education Center and Energy Lake are closed to all waterfowl hunting. LBL permit required. No waterfowl hunting permitted on inland areas during quota gun deer hunts. Permanent blinds are prohibited on inland areas and along Kentucky Lake shoreline area. Decoys and blinds must be removed at the end of each hunting day. Between Kentucky and Barkley lakes. Access by KY 453 (The Trace) and KY 80. Many secondary roads and trails within area. Terrain varies from gently rolling to fairly steep; much of area is forested with many clearings, old farm sites, plantings.